Trimukhi Platform, is a 10 years old Santhal/Bengali/French organisation dedicated to produce contemporary arts forms (performing arts, sound, visual and video arts), build bridges between different human worlds and stimulate the invention of singular thought. It was founded in West Bengal, India, by 18 families from the tribal Santhal village of Borotalpada, a social facilitator from Kolkata and an out-of-the-ordinary French theatre director and philosopher residing in India. Since 2008, Trimukhi Platform has invited to collaborate artists and philosophers from Canada, Colombia, Cuba, Ecuador, France, India, Japan, Mexico, Spain and South Africa. So far Trimukhi Platform has built 1 Cultural Centre, organised 7 Night of Theatre festivals, staged 11 theatre-dance-video performances, set up 5 sound happenings, collaborated in 3 art installations, realised 5 video-art films and printed 3 issues of its yearly publication on contemporary arts practices Fabricate (Fabric of ) Arts • Fabrique de l’Art. Partly inspired by the thinking of Gilles Deleuze, the conviction that inhabits us at Trimukhi Platform is the following: in order to produce art and thought today, with quality, rigour and relevance, we need diversity, human and social diversity. For when art creation today consists in disposing of differences, combining them to produce original potentials (aesthetic effects), the notion of social action changes meaning: in order to expand the possibilities of heterogeneous combinations, it is important to put different human worlds into contact – and, as a result, to nurture social links. Similarly, while thought generation – through the reinvention of terminology – promotes continual questioning of practices, it requires, to attain a level of relevance, diversity in points of view and experiences. Here again, ‘others’ are necessary. No one comes back unaltered from Borotalpada. Trimukhi Platform is made for that: so that differences be not anymore given borders between already existing groups, but lines of fault that traverse each one of us. In a globalized world, Trimukhi represents an alternative to the standardized devastation of the world. Not because it vindicates the purity of each particularity; Trimukhi does not bother with authentic ethnicity and what it offers, as I have said, could very well exist in Avignon or Wuppertal. But it creates a common ground that is not preempted by one interpretation. For this reason we can say it is “global”. The global is not one and the same reality for everyone. The global is what we have to share and that in which we have to replay our differences. I think I have witnessed maybe for the first time in my life, in the small village of Borotalpada, in West Bengal, during a Night of Theatre, what global art of the future might look like. When the sun sets in Borotalpada on January 28, the sound of dhaks will vibrate over the paddy fields. Under a massive ceremonial umbrella in a clearing, a group of women will match the beats with nifty footsteps. Their sinuous limbs swaying in rhythm, they perform an ancient dance ritual called Buru Jatra in honour of the hill deity of Santhal society. 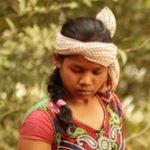 This time, however, their audience will be art lovers from accros the country and the world who have gathered for the “Night of Theatre”, a performance arts festival that is taking place in the Santhal village of Borotalpada from dusk to dawn. Across the Subarnarekha, where the road ends and rolling fields spread out against the sky, is a sleepy Santhal village called Borotalpada. 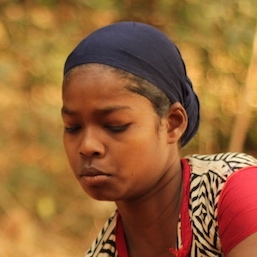 On Saturday, this remote Adivasi village was buzzing with activity. For, it was a Night of Theatre. A theatre with home-grown actors. A theatre of the soil. A contemporary theatre, directed by Jean-Frédéric Chevallier, a French professor (of theatre and philosophy) who has made Kolkata his home since 2008. Chevallier’s is a theatre of the present, where life will be presented, not represented; theatre where life unfolds as life as we experience it. There was something magical about making one’s way through the backwoods and settling down under the open skies, feeling the caress of a wintry breeze and watching performances in the dark — imaginative and untamed. Our sense of disorientation was pushed to the limit: the stage was amazingly innovative and there was a constant effort to tickle the senses. 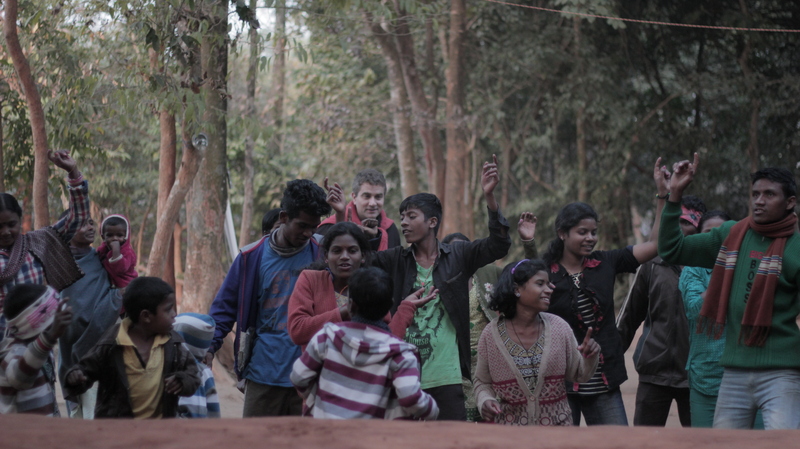 […] Fourteen families, including children, from the village are now members of Trimukhi Platform and take part in the Night of Theatre as well as in the collective decisions of the Cultural Centre.